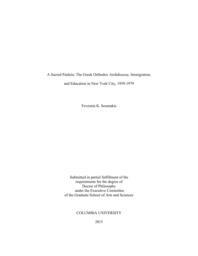 This dissertation examines the role the Greek Orthodox Archdiocese of North and South America played in shaping Greek education in New York City during the period 1959-1979. Beginning in 1959, when Archbishop Iakovos was appointed as the fourth Archbishop by the Ecumenical Patriarch, the Archdiocese focused its attention on expanding and modernizing educational institutions. The Archbishop advocated for a “resurrection of a Greek Orthodox consciousness” in education that would instill knowledge of the Greek language, as well as the historical, cultural, and religious legacy of the Greek Orthodox nation. As parish communities in New York City and the new wave of Greek immigrants heeded the call to build and expand parochial schools over the course of the 1960s and 1970s, the Archdiocese’s Department of Education also sought to modernize its curriculum and books, in addition to the challenging task of upgrading the teacher training program at St. Basil’s Academy. Modernization, however, did not entail assimilation and a diminishing of Hellenism, but a renewal of a Hellenic Orthodox identity within a religiously and ethnically pluralistic society. In part, several factors influenced the educational agenda of the Archdiocese: the historical position of the Church in relation to education, the needs of the new immigrants within the broader context of Greek Americans in the US, and the politics of Greece in relation to Cyprus and Turkey. This study ends in 1979 when shifts in demographics, declining enrollments, and competition with public schools compelled the Archdiocese and parish communities to reassess the future of their educational programs. This work weaves the Greek American immigrant experience into the broader narrative of immigration to New York in the post-1965 period. A more complex and dynamic portrait of Greek American education in New York emerges as well as the central role played by the Greek Orthodox Archdiocese. The insights from this work contribute the Greek American educational experience to the larger body of scholarship on the history of education in the United States.